Great news for all Apple fans in the Philippines who've long been waiting for the official launch of the Cupertino company's two 2015 flagship smartphones in the country! 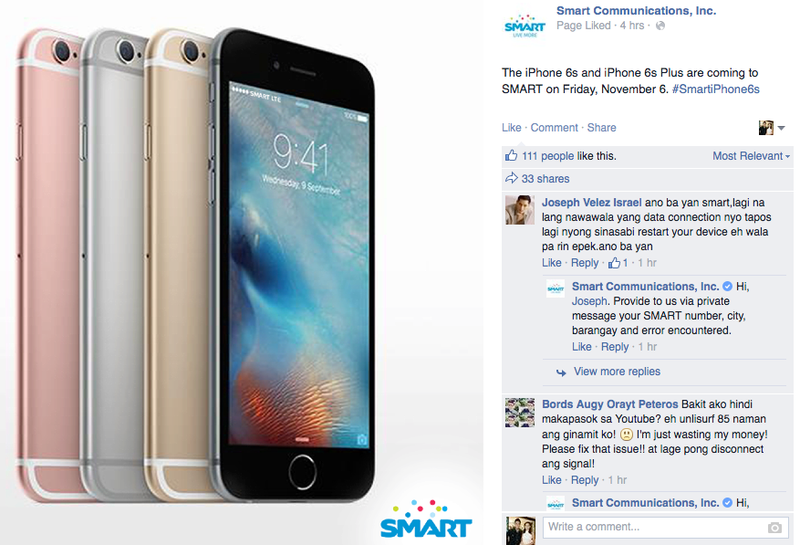 Smart Communications, Apple's official and authorized local carrier partner, has just confirmed via its Facebook page that Apple iPhone 6S and the bigger Apple iPhone 6S Plus will be formally available nationwide starting on November 6, 2015 -- that's just two Fridays from now! Learn more about Apple iPhone 6S and Apple iPhone 6S Plus. Last year, Apple iPhone 6 (16GB) was offered starting at Smart Postpaid Plan 999, with Php 800 monthly cash-out or a total of only Php 1,799 per month. The Apple iPhone 6 Plus (16GB), on the other hand, was made available starting at Plan 999 with Php 1,050 cash-out every month, or Php 2,049 per month. Both iPhone offers came with FREE All-Net texts, All-Net calls plus consumable data every month which can be used for video and music streaming, file uploads, and downloads, and chatting. It remains to be seen whether Smart will offer the same attractive packages for the Apple iPhone 6S and iPhone 6S Plus this year. Though, I'm confident that they'll have even more amazing #SmartiPhone6S and #SmartiPhone6SPlus plans this year giving consumers great value for money and allowing them to live their Smart Life to the fullest. Apple iPhone 6s and Apple iPhone 6s Plus bring a powerful new dimension to the Cupertino company’s revolutionary Multi-Touch innovation with 3D Touch, which now senses how deeply you press the display, letting you do essential things more quickly and simply. The new iPhones introduce Live Photos, which bring still images to life, transforming images frozen in time into unforgettable living memories. Live Photos, 3D Touch, 12 MegaPixel iSight camera, 5 MP FaceTime HD camera with Retina Flash and more features are powered by the all-new Apple-designed A9 chip that delivers both faster performance and great battery life. iPhone 6s and iPhone 6s Plus are designed with scratch-resistant and shatter-proof Sapphire glass and 7000 series aluminum, the same metal alloy used in the aerospace industry, in gorgeous metallic finishes that now include Rose Gold. iOS 9 brings more intelligence to iPhone with proactive assistance, powerful search and improved Siri features, all while protecting users’ privacy. Built-in apps become more powerful with a redesigned Notes app and detailed transit information in Maps. The foundation of the Apple iOS mobile platform is even stronger now with software updates that require less space to install and advanced security features to further protect your devices. "Sales for iPhone 6s and iPhone 6s Plus have been phenomenal, blowing past any previous first weekend sales results in Apple’s history. Customers’ feedback is incredible and they are loving 3D Touch and Live Photos, and we can’t wait to bring iPhone 6s and iPhone 6s Plus to customers in even more countries [including the Philippines]," discloses Mr. Tim Cook, Apple's current CEO.